QuickCheck™ Flex Cryoscope | Page & Pedersen International ltd. The only 12 Volt -DC powered (battery)instrument, the portable QC-FLEX is a tool for rural or remote locations off the ‘grid’ or in areas where AC power is not always reliable. Applications include milking parlors, bulk tanks, collection centers, milk trucks, use by herd management teams & field reps. Bringing you real-time information about added water, when you need it – where you need it: Check the bulk tank to monitor for added water caused by improperly drained lines, condensation, etc. Screen milk samples for extraneous water upon pick up at the farm, prior to loading, to confirm compliance with recommended levels. Optional AC capabilities (w/an external power supply) facilitate use in milk reception, on-farm bottling & dairy processing plants. Check milk collected in the bulk tank to monitor for added water which can be caused by improperly drained milking lines, condensation in the bulk tank etc. Laboratory: Rapid, reliable tool for detecting added water in both incoming raw milk and processed products. Dependable, robust, with streamlined user-friendly calibration procedure, the QCFLEX is an ideal HACCP tool for product safety, quality and standardization. Dairy Science Studies: User-friendly, simple to use, cost-effective, convenient tool for introducing dairy science technicians and students to testing requirements. 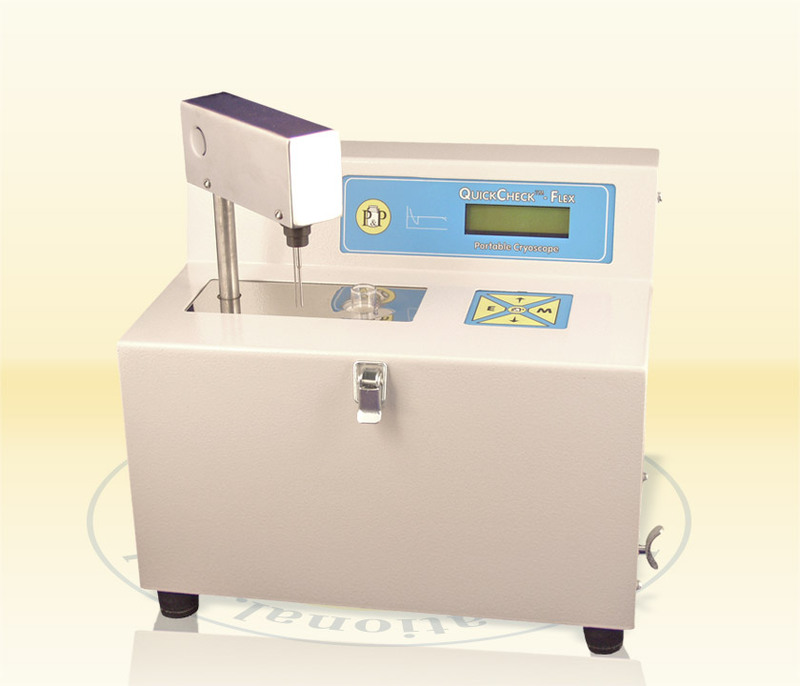 The QuickCheck™ Flex is a portable freezing-point Cryoscope, providing precise results for added water in milk in accordance with recommended reference methods (AOAC/IDF/ISO) for payment purposes. The only DC Operated Cryoscope on the market!